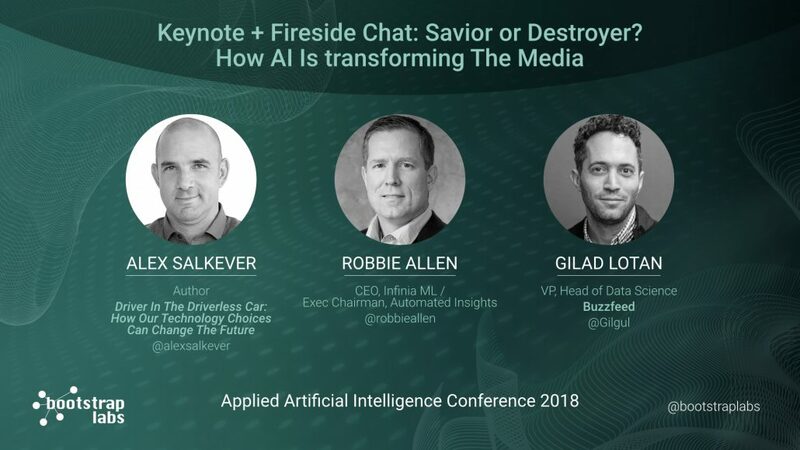 During this session, the panelists discussed the future of AI and the media, how it’ll empower journalists and generate new revenue streams for localized reporting. We’re already consuming content that’s generated with Artificial Intelligence like sports and election results. But AI is still limited in terms of content creation, it’ll take another 10 years for AI to write a high school essay. We need to keep our priorities straight and optimize for the right metrics, optimizing for something like CTR can lead to polarization. AI will give reporters superpowers, they’ll be able to write stories and leverage data in ways that was impossible without technical skills. Alex Salkever is a writer, futurist and technology leader. He is the co-author with Vivek Wadhwa of “The Driver in the Driverless Car: How Our Technology Choices Can Change the Future”. The book was named as a Finalist in the 2017 McKinsey / Financial Times Book of the Year Competition. He previously served as the Technology Editor at BusinessWeek.com and as a Guest Researcher at the Duke University Pratt School of Engineering. His first book, “The Immigrant Exodus: Why America Is Losing the Global Race to Capture Entrepreneurial Talent” was named a Book of the Year by The Economist in 2012. Alex has served as a senior executive at a host of Silicon Valley startups in green technology, data science, open government, and cloud computing. He speaks regularly at industry conferences, universities and schools and to corporations and Boards of Directors. Robbie Allen is the CEO of Infinia ML, which helps enterprise organizations implement ML solutions. Previously, he founded and led Automated Insights, whose natural language generation software helped automate content production for The Associated Press, Yahoo!, and others. Robbie has authored or coauthored 10 books and has spoken at multiple conferences including: O’Reilly AI Conference, Strata, SXSW, and the MIT Sloan CIO Symposium. He holds two Master’s degrees from MIT and is completing his Ph.D. in CS at UNC-Chapel Hill. Gilad is the Head of Data Science at BuzzFeed where he leads a team that’s tasked with building state of the art analytics and data products to support entertainment, news, business and tech. Previously Gilad led Data Science at beta works, and built data products and Microsoft. Gilad’s work has been covered across a wide range of academic journals and publications, most recently focused on propaganda and bias within algorithmic ranking systems.